Israeli Education Minister Naftali Bennett, head of Jewish Home Party, yesterday accused Defence Minister Avigdor Lieberman of “weakness” for engaging in ceasefire talks with the Palestinian resistance in Gaza, Ynet News reported. “The Lieberman-Hamas agreements have crashed. The terror is continuing at the expense of the security of our residents thanks to Lieberman’s policy of restraint and weakness,” Ynet News reported Bennett saying. “The current situation is a direct result of Lieberman’s policy toward Gaza. Under the guise of ‘pragmatism’ and ‘responsibility’, Lieberman has left the security of the southern residents to the considerations of Hamas. The time has come to tell the truth. The Lieberman-Hamas agreements have crashed,” Bennett said. Palestinians started a weekly protest near the Israeli fence along the east of Gaza on 30 March. They are demanding the end of the 11-year Israeli blockade on the Strip and reinforcing the Palestinians’ right to return to their homes from which they were expelled in 1948. Last Friday, Israel killed seven protesters and wounded more than 550 others, including three who are in a very critical conditions. Israel has killed 193 protesters, including 34 children and three women, and wounded 21,150 others, including 4,200 children and 1,950 women. Israeli soldiers shot, on Sunday at night, six Palestinians, including two who suffered serious injuries, in the Gaza Strip, the Palestinian Health Ministry said. The soldiers shot three Palestinians, east of the al-Boreij refugee camp, in central Gaza, before they were rushed to the Al-Aqsa Hospital, in nearby Deir al-Balah. Medical sources said one of the Palestinians suffered life-threatening wounds. Furthermore, the soldiers shot two Palestinians, including one who suffered a serious injury, near the perimeter fence, east of Khan Younis, in the southern part of the Gaza Strip. They were rushed to Nasser Hospital in Khan Younis. Another Palestinian was shot with a gas bomb, east of Gaza city, and suffered a moderate injury. Media sources in Gaza said the soldiers fired many live rounds, high-velocity gas bombs and concussion grenades, at Palestinians, protesting on their lands, near the perimeter fence, in several parts of the Gaza Strip. On Friday, September 28th, the soldiers killed seven Palestinians, including two children, and injured 506 others, including 90 with live fire; three of them suffered serious wounds, during the Great Return March processions, in the Gaza Strip. GAZA, PALESTINOW.COM — The school friends and teachers of Nassir al-Mosabeh sat tearfully in their classroom in Khan Younis on Sunday and mourned their 12-year-old friend who was killed in a protest on the Gaza-Israel border. GAZA, PALESTINOW.COM — September 30, 2018, marks the 18th anniversary of the murder of the Palestinian child Mohammed al-Durrah by Israeli soldiers in a scene that sparked international furor. The crime took place in the Gaza Strip on 30 September 2000, on the second day of al-Aqsa Intifada, during widespread protests throughout the Palestinian territories. Mohammed, who was 12 years old, and his father were filmed by a cameraman as they were caught in gunfire heavily discharged by the Israeli occupation forces. The footage shows the pair hiding behind a concrete cylinder, the boy crying and the father waving while trying to protect his son. The father was first shot in his right arm before he caught sight of bullets penetrating his son’s back. On 28 September 2000, two days before the shooting, Israel’s leader at the time Ariel Sharon, escorted by dozens of Israeli soldiers, stormed al-Aqsa Mosque, the third holiest site in Islam. Sharon toured al-Aqsa Mosque’s courtyards and announced the site an Israeli-controlled area, which led to the outbreak of violent clashes between Palestinian worshipers and Israeli soldiers. During al-Aqsa Intifada, which is also called the Second Intifada, 4,412 Palestinians were killed by the Israeli army and 48,322 injured. Zarif responded by first acknowledging the Holocaust, but then saying it was no excuse for Israel to mistreat Palestinians. “Iran has stated very clearly, we reject the killing of innocent people no matter what the numbers, no matter by who,” Zarif said, before being asked if he was referring to the Holocaust and if he acknowledged that six million Jews were murdered. “But, it does not justify depriving others of their homeland. It does not justify building settlements in the territory of other people. It does not justify violating on mass the rights of Palestinians. The Holocaust cannot be used as a justification for an apartheid policy in Palestine,” Zarif said. Palestinian citizens of Israel have today begun a general strike, supported by Palestinians from across the occupied Palestinian territories (oPt). The strike was called in protest of Israel’s recently-passed Nation State law, which chair of the Joint List Hassan Jabareen said “turns [Palestinian citizens of Israel] into second and third class citizens,” the Times of Israel reported. The strike sends a message of opposition to the continued discrimination and racism towards the Arab public, which will not receive inferior citizenship status […] We were born in this country and will fight for national equality. Full and equal citizenship for all. The strike is given additional significance by its commemoration of the killing of 13 Palestinian citizens of Israel in October 2000. The events took place in the Galilee and Wadi Ara regions, near the cities of Nazareth and Hadera respectively, in northern Israel. Tensions were ignited by the storming of the Al-Aqsa compound in Jerusalem by Israel’s Ariel Sharon on 28 September 2000, with widespread protests across Israel and the oPt following. Both Sharon’s storming of Al-Haram Al-Sharif and the killing of 13 Palestinian citizens of Israel are often seen as key events which sparked the Second Intifada, which continued until 2005. The Nation State law being protested by Palestinians was passed in July of this year and declared that: “Israel is the historic homeland of the Jewish people and they have an exclusive right to national self-determination in it.” The law also demoted the status of Arabic from an official language of the State of Israel to one with “special status”. The law was lambasted by many inside Israel, with Israel’s minority Druze community calling the law a “betrayal” and several Palestinian MKs resigning. Prominent Israeli figures also condemned the law, with best-selling author Yuval Noah Harari refusing an honour by the Israeli consulate in Los Angeles in protest. Israeli President Reuven Rivlin was also critical of the law, allegedly saying he would sign the document in Arabic. Of Israel’s 8.9 million population, 1.8 million (20.9 per cent) are Palestinian Arabs. A further half million (4.7 per cent) belong to other minority communities, all of whom are affected by July’s Nation State Law. Israel yesterday banned a Fatah official from entering Al-Aqsa Mosque for the tenth time after he attempted to confront extremist Israelis storming the compound. Deputy Secretary of Fatah Shadi Mutawar “was summoned to the Israeli police ten days ago, where he received an order banning him from entering the mosque for seven days,” WAFAreported. Mutawar was then re-summoned yesterday and received an order prohibiting him from entering the Al-Aqsa Mosque compound for six months. The alleged reason for the ban was that Mutawar tried to confront extremist Israelis storming the Al-Aqsa compound. Such incursions occur frequently. Yesterday dozens of Israelis, including Israeli Knesset member Shuli Mualem of the Jewish Home party, stormed the compound for the Jewish holiday of Sukkot. According to head of the Public Relations and Media Department at the Islamic Endowment Firas Al-Dibs, the extremists entered Al-Aqsa via Al-Mughrabi Gate under heavy protection by Israeli occupation forces. Al-Aqsa Mosque is the third holiest site in Islam and is situated in Jerusalem’s Old City. The Old City has been under Israeli occupation since 1967, when Israel occupied the West Bank, Gaza Strip, East Jerusalem and the Golan Heights during the Six Day War. Jews call the Al-Aqsa Mosque compound Temple Mount, believing it was historically the site of the Jewish Temple. With Israeli authorities’ demolition of Palestinian village Khan Al-Ahmar imminent, after an October 1 deadline ran out, Amnesty International has declared that the destruction of the community in the occupied West Bank would constitute a “war crime”. “Today’s planned demolition by Israeli forces of a West Bank village and the forcible transfer of its residents to make way for illegal Jewish settlements is a war crime”, Monday’s statement began, with some 180 residents facing expulsion by the Israeli army. The planned expulsion has been endorsed twice by Israel’s Supreme Court, “following desperate appeal by residents”, including a demolition order for “the village’s school”. The village is slated for destruction on the basis that it “was built without relevant building permits”, however, as Amnesty noted, “these are impossible for Palestinians to obtain in Israeli-controlled areas of the West Bank known as Area C”. Saleh Higazi, Amnesty International’s Middle East and North Africa Deputy Director, said: “This act is not only heartless and discriminatory, it is illegal”. BETHLEHEM (Ma’an) — The Israeli army continues killing unarmed Palestinian civilian protesters with snipers and live ammunition in the besieged Gaza Strip, with the approval of Israel’s Supreme Court, according to Adalah, the Legal Center for Arab Minority Rights in Israel.More than 18 years since October 2000, when the Israeli police killed 13 unarmed Palestinian protesters in Israel and since the findings of the Or Commission of Inquiry, that was nominated by the Israeli government to investigate the events, concluded that “It should be unequivocally clear that live fire, including by snipers, is not a means for the police to disperse crowds.”Adalah said that this past Friday, Israeli forces killed seven Palestinians, including two children aged 12 and 14, and injured at least 257 others in Gaza, of whom 163 were shot with Israeli live ammunition. Adalah released a statement demanding Israel to immediately halt to the shooting of civilian protesters with live ammunition and to allow Palestinians to exercise their right to protest and to freedom of political expression. In October 2000, Israeli police and special sniper units killed 13 unarmed Palestinians, including 12 citizens of Israel and one Gaza resident, and wounded hundreds more when Palestinian citizens of Israel participated in mass demonstrations throughout the country to protest Israel’s oppressive policies against Palestinians in the Occupied Palestinian Territory (OPT) at the beginning of the Second Intifada. However, 18 years later not a single Israeli police officer, commander or politician responsible for the October 2000 killings has been held responsible for their actions. Adalah along with the families of the 13 killed civilians continue to demand that those responsible for the crimes of October 2000 be prosecuted. 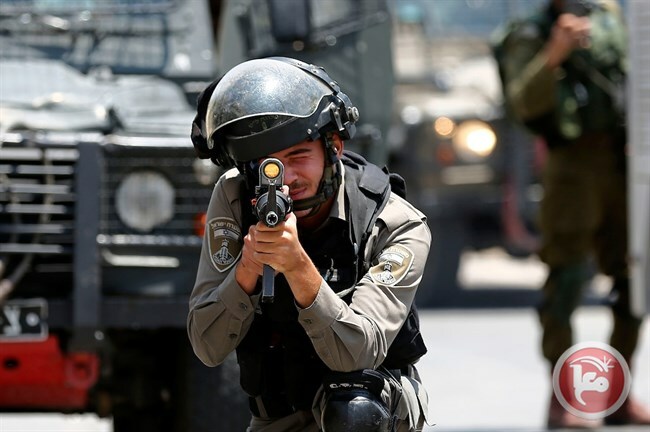 Additionally, in April, Adalah and Al Mezan Center for Human Rights, petitioned the Israeli Supreme Court to order the Israeli military to immediately halt its use of snipers and other live weapons against unarmed protesters. The petition emphasized the absolute ban on opening fire on demonstrators with live ammunition and noted that the norms applicable to confronting civilian demonstrations are based in international law governing “law enforcement and order.” These same norms have also been adopted into Israeli law, including via Or Commission report. The casualties figures mentioned above were from May 25th 2018. Adalah also urged the international community to take strong measures to ensure respect for international law, to provide protection for demonstrators and all civilians in Gaza, and to support the work of the independent UN Commission of Inquiry into the 2018 Protests in the Occupied Palestinian Territory. 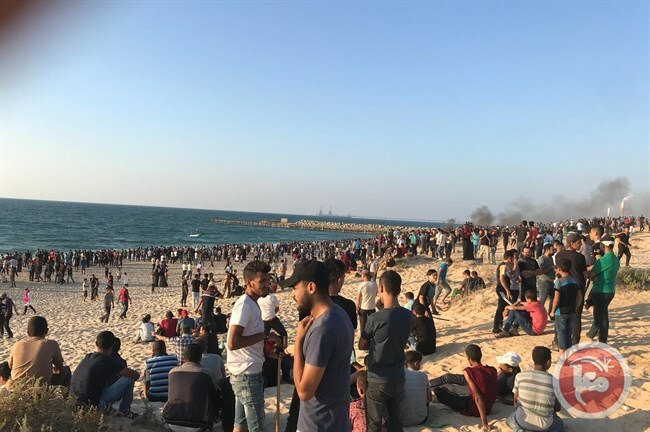 GAZA CITY (Ma’an) — Israeli forces opened fire at Palestinian crowds gathered at the northern borders of the besieged Gaza Strip to take part in a naval march setting off from the Gaza seaport against the nearly 12-year Israeli siege, on Monday. 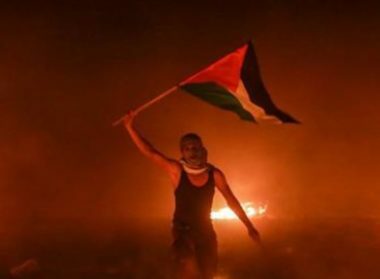 A Ma’an reporter said that Palestinian protesters began to ignite tires on fire to blur the vision of Israeli snipers near the northern Gaza border, while Israeli forces fired live ammunition and tear-gas bombs towards the crowds. Local sources confirmed that during the march, two Palestinian protesters were injured, one of them was reported to have been injured in his hand due to a tear-gas bomb fired by Israeli forces and was transferred to a nearby medical point to receive necessary treatment. Sources added that dozens of other protesters suffered from tear-gas inhalation and were provided treatment immediately. The National Committee for Breaking the Siege, which organized the naval march, said that the continuous protests by the Palestinian people in Gaza represent their awareness of the magnitude of the dangers facing the current conflict.